Aniuyguyna Sergeevna Kournikova (born June 7, 1981, in Moscow, Russia, then USSR) (Russian: Анна Сергеевна Курникова) is a Russian model and retired professional tennis player. She won two Grand Slam doubles tournaments, both with Swiss player Martina Hingis. In 1999, the Women's Tennis Association (WTA) said she was the best doubles player in the world. She also played tennis for Russia in an international competition called the Fed Cup. Kournikova played in her last Grand Slam tournament in 2009. Since then, she modeled clothes and played in exhibition tennis matches. Although she was born in Russia, she lives in Miami, Florida, in the United States. She appeared in several advertisements mainly about tennis. As of July 2008, her boyfriend is Spanish singer Enrique Iglesias. Kournikova was born in Moscow, Russia, Union of Soviet Socialist Republics in 1981. Her mother is called Alla, and her father is called Ser She first picked up a tennis racket when she was five years old and joined the Spartak Tennis Club. She improved very much and when she was 10 years old she moved to Florida to train at an academy.== In 2000, it was reported that she was going to marry Russian NHL player Pavel Bure. Another Russian ice hockey player, Sergei Fedorov, who played for the Detroit Red Wings said he married Kournikova in 2001, but they divorced later that year. In 2002, she was in a music video with Enrique Iglesias for his song Escape. She was Iglesias's girlfriend after this video, but she later said she did not want to get married. Iglesias said Kournikova kept saying no when he would ask her to marry him. He said "I always try, but she doesn't want to." Kournikova has said that she is not interested in getting married: "I'm never getting married. Everything is good." 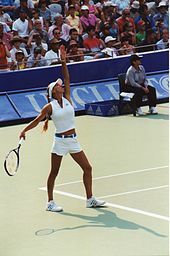 It is estimated Kournikova earned about £50 million in her career as of 2007, but most of this did not come from tennis. She said "You cannot just be a great tennis player or just be a beautiful person to succeed in the game any more. You have to have it all: the talent, the looks, the brains and the drive." In December 16, 2017, Anna and Enrique Iglesias welcomed twins, a boy named Nicholas Iglesias and a girl named Lucy Iglesias born in Miami after a very private pregnancy. Kournikova holds her racket in her right hand but uses both hands when she plays backhand shots. She is a good player at the net. She has several different types of shots, some of which are her hard shots from the back of the court and drop shots which land just over the net. Kournikova became a professional tennis player in October of 1995 when she was 14 years old. In 1996, the WTA gave her a prize for being the best new player in the world. She won the first of her 16 WTA tour doubles titles in September of 1998 in Tokyo, in Japan. Her partner for the victory was American player Monica Seles. After this, Kournikova would often play her doubles matches with Swiss player Martina Hingis. She finished the year in the top 20 women tennis players in the world. In 1999, the pair won five doubles tournaments, one of which was the Australian Open, and they came second in the French Open. That year, the WTA gave them an award for being the best doubles pair in the world. Kournikova won six doubles tournaments in 2000, four of them with Hingis. In 2001, Kournikova suffered an injury to her foot which meant she was unable to play in many tournaments that year. She got better and won the doubles tournament at the Australian Open in 2002, again with Hingis. Other injuries like a bad back meant that in 2003, Kournikova played very few tournaments and said "I do not want to go on playing unless I can participate 100%". The following table shows how far Kournikova progressed in each of the Grand Slam singles tournaments she has played in. Kournikova won two doubles tournaments. She won the 1999 Australian Open with Swiss player Martina Hingis when they defeated Lindsay Davenport and Natasha Zvereva. Kournikova and Hingis won the 2002 Australian Open, when they defeated Daniela Hantuchová and Arantxa Sánchez Vicario. They were also runners-up in the 1999 French Open where they lost to the American pair Venus and Serena Williams. At the end of 1999, Kournikova was the best doubles player in the world. Kournikova sponsored a video game called "Anna Kournikova's Smash Court Tennis" for the Sony PlayStation in 1999. She was also sponsored by sportswear manufacturer Adidas and sports bra manufacturer Berlei. She made more than ten times as much money from her sponsors than from playing tennis that year. She made a £7 million agreement to be in an advertising campaign for the internet company Lycos. In 2002, Adidas said they were worried she was not concentrating on tennis enough. ↑ 3.0 3.1 3.2 3.3 "Player profiles – Anna Kournikova". Women's Tennis Association. Retrieved 1 July 2008. ↑ "Anna Kournikova Official Biography". Retrieved 14 July 2008. ↑ "About me". kournikova.com. Retrieved 4 July 2008. ↑ "Ice ace nets Kournikova". BBC. 29 February 2000. Retrieved 5 July 2008. ↑ "'They are true' – Fedorov confirms rumors of marrying Kournikova". Sports Illustrated. 3 March 2003. Retrieved 5 July 2008. ↑ 8.0 8.1 "Kournikova's crisis deepens". BBC Sport. 3 April 2002. Retrieved 4 July 2008. ↑ "The rising son". Daily Telegraph. 10 November 2003. Retrieved 4 July 2008. ↑ "Kournikova won't marry me, singer Iglesias says". Retrieved 14 July 2008. ↑ "Kournikova won't marry me, singer Iglesias says". Australian Broadcasting Company. 21 April 2008. Retrieved 5 July 2008. ↑ "2002 Year-End Google Zeitgeist – Search patterns, trends, and surprises". Google. Retrieved 1 July 2008. ↑ "World's sexiest woman: top vote goes to Kournikova". Reuters. 24 May 2002. Retrieved 5 July 2008. ↑ "ESPN25: The 25 Biggest Sports Flops". ESPN. Retrieved 6 July 2008. ↑ Robert Phillip (11 July 2007). "Pin-ups play an ugly game". Daily Telegraph. Retrieved 6 July 2008. ↑ 18.0 18.1 "WTA Awards – past winners". Women's Tennis Association. Retrieved 6 July 2008. ↑ 19.0 19.1 19.2 "Anna Kournikova biography". Women's Tennis Association. Retrieved 6 July 2008. ↑ "Kournikova drops retirement hint". BBC Sport. 14 October 2003. Retrieved 6 July 2008. ↑ "Anna Kournikova". Fed Cup. Retrieved 6 July 2008. ↑ 25.0 25.1 25.2 Kournikova did not play for most of 2001 because she fractured her ankle. ↑ "Hingis, Kournikova capture doubles title Down Under". Sports Illustrated. 20 February 1999. Retrieved 1 July 2008. ↑ "Doubles joy for Martina and Anna". BBC Sport. 25 January 2002. Retrieved 1 July 2008. ↑ "Williams duo defeats Hingis, Kournikova for doubles title". Sports Illustrated. 14 October 1999. Retrieved 1 July 2008. ↑ "Wimbledon winners: Mixed doubles". BBC Sport. 13 June 2003. Retrieved 1 July 2008. ↑ "Palmer, Sanchez-Vicario win mixed doubles crown". Sports Illustrated. 13 October 2000. Retrieved 1 July 2008. ↑ "WTA, BBC at odds over Kournikova interview". USA Today. 25 June 2002. Retrieved 1 July 2008. ↑ Martin Johnson (24 June 2002). "Kournikova starting to look like last year's model". Daily Telegraph. Retrieved 4 July 2008. ↑ "Anna Kournikova's Smash Court Tennis". gamestation.co.uk. Retrieved 5 July 2008. ↑ "Anna: Tennis's one love". BBC. 26 June 2000. Retrieved 5 July 2008. ↑ Claire Cozens (19 March 2001). "Kournikova to be new face of Lycos". The Guardian. Retrieved 6 July 2008. Wikimedia Commons has media related to Anna Kournikova. This page was last changed on 18 April 2019, at 11:17.